This article contains the legacy content editor help centre documentation. 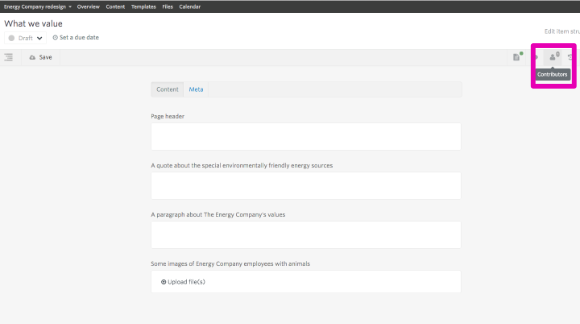 Here you will find links to all functionality available in the legacy version of GatherContent. How do I know which version of GatherContent I'm using? Based on your navigation, you can tell which version of GatherContent you're using. You may already be using the newest version. Click here to access our Help Centre to search our help documents. Not yet on the newest version but want to be? Click here to schedule your account upgrade. Which help article are you looking for? 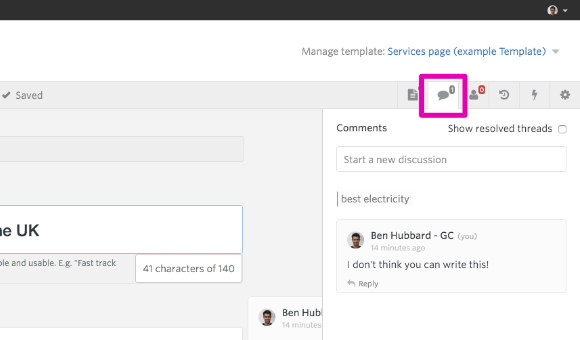 Find out how to add comments to an item, and share feedback with other people using the legacy content editor. This article is for the legacy content editor. 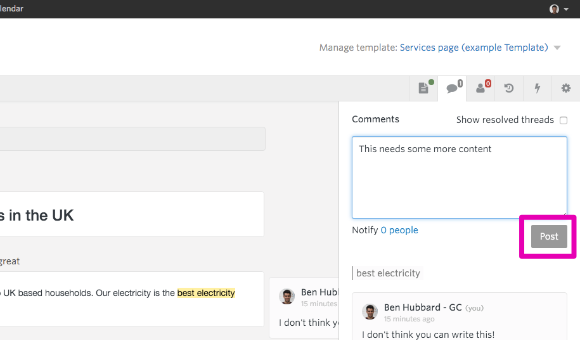 You can use comments to discuss your content. Every Item has its own general discussion thread, and you can comment directly on text using ‘in-line’ comments. 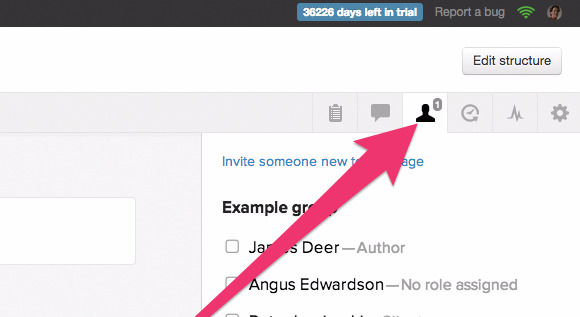 Notification emails will be sent to people that are assigned to the Item when you make a new comment, and you can also reply directly to comments from your inbox. You can choose not to send these notifications. 1. 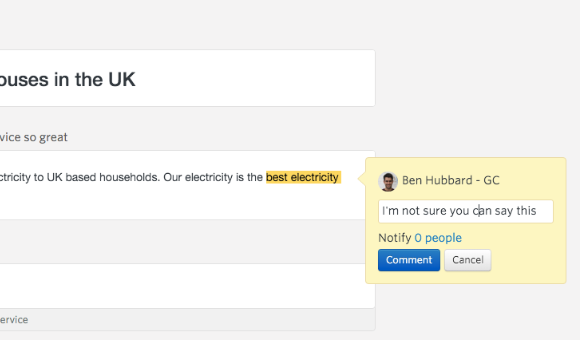 Highlight some text and select to "Add comment"
You can choose to notify people by clicking on the number of people. Your comment will now be visible on the Item and people can reply to it directly. #1: You can quickly see which Items have a new comments on them by going to the Content tab and looking for a blue comment icon on Items (this means there is a comment that you haven’t read yet). 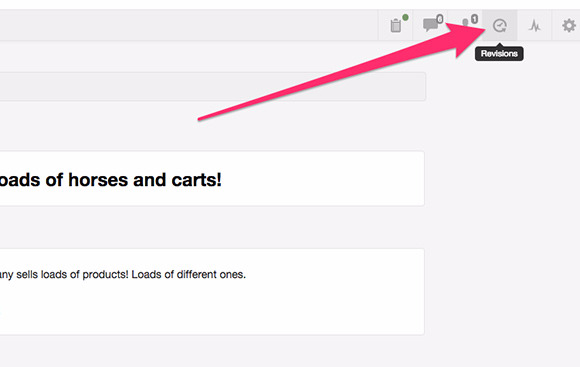 #2: You can also add comments to Items that are in 'Read-only' mode. Find out how to write content in the legacy content editor, available formatting options and more additional information. An item is broken down into a series of fields, which allows the content to be broken up into smaller chunks. This is where you write your content. Each field has a label, some field guidelines, and if you specify, a word or character count. This helps authors write the content you need, in the format needed. The field label is used to let the author know what content is required to be added to this field, and the field guidelines expand on this. If a character or word limit has been set, this will show as you type and the field will alert you if the limit has been reached. Here's more information on word and character limits. As you're typing, you'll notice that the content is regularly being saved. You can also press the save button to create a manual revision. 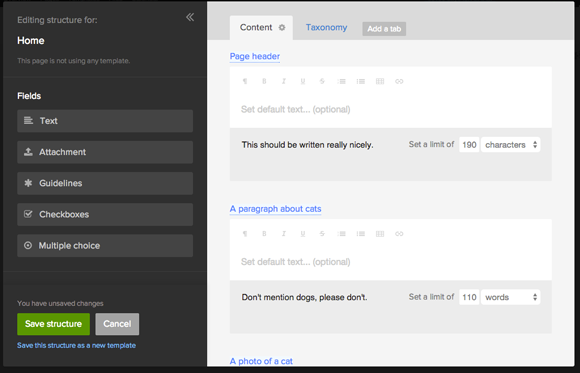 If you're writing in a Rich Text Field, you can format any text using the simple editing tools at the top of the item. You can set a different level of heading, some standard text, as well as bold, underlined, italics and strikethrough. You can also add a link, insert a table and view the HTML version of the field from these tools. When you've selected a Rich Text Field, the editing bar will appear at the top. Highlight any text you want to apply formatting to and apply the formatting, or click the formatting button of choice, and start typing. 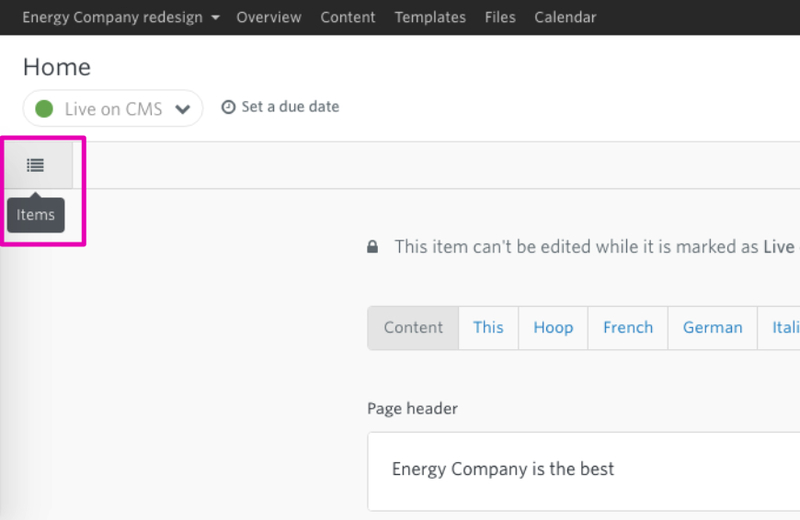 Any content that you paste into a GatherContent field will have all its styling removed, so you're left with content with clean HTML applied to it, ready for export into another system. Bold, italic, strikethrough and underline will be carried across. GatherContent does not have a native spell checking, autocorrect or custom dictionary function built into the Item Editor as they are all built into the browser you're using. #1: Only one person at a time can edit an Item, but multiple people can collaborate on the content reviewing process. You can request access to become the editor of an Item. #2: You will not be able to edit the Item if it's in a 'Read-only' workflow status, however you will still be able to add comments to the Item. 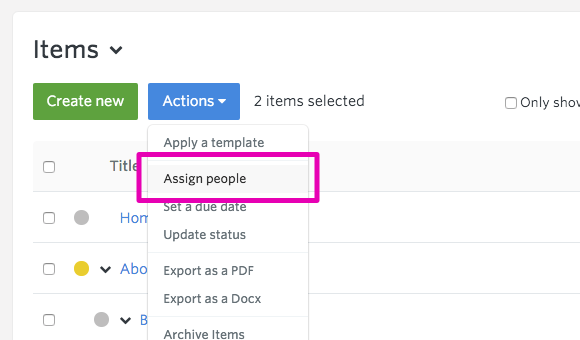 Learn how to work with other people on your content at the same time, in the legacy content editor. 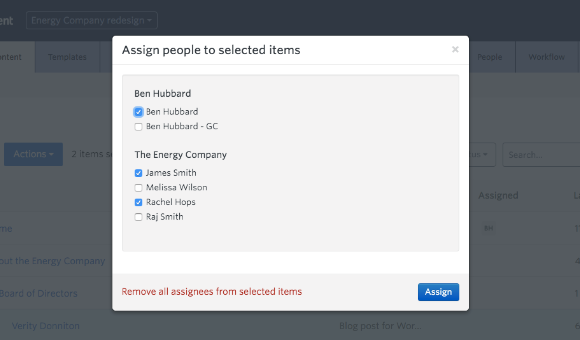 Multiple people can collaborate on an Item in GatherContent at the same time. One of these people can edit, and the others viewing the Item can reply to comments and view updates to the content. 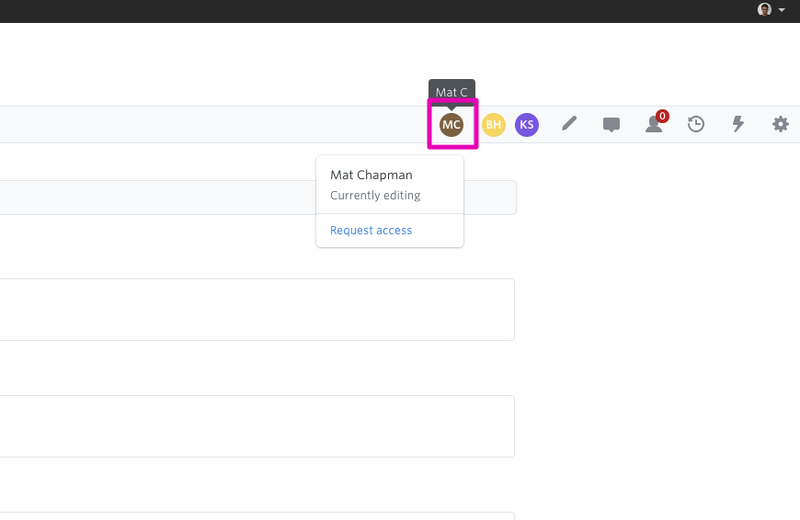 You can also give access to another editor by clicking on their initials, and clicking “Give Access”. Tip: After an editor has been idle for 5 minutes anyone who requests access will be granted it immediately. 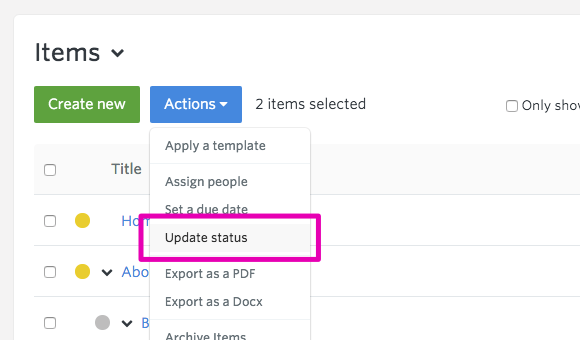 Here's how you can update the workflow status of an item from the legacy content editor. Choose the new status you'd like the Item to have. People assigned to this item will be selected by default. You can also choose people to loop in. Tip: Items that are updated to a 'Read-only' workflow status will not be editable, however you can still add Comments to them. 4. 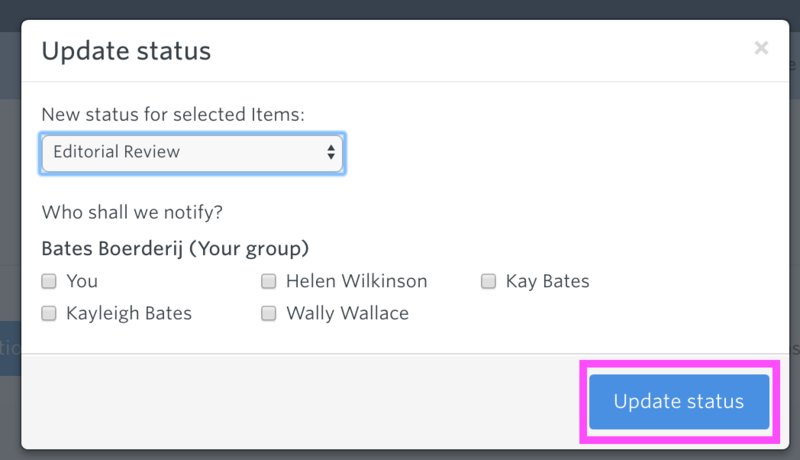 Select the status you want to change the Items to, and click "Update Status"You can select who to notify about this change from the list. How to restore an item to a previous version as well as compare what's changed between versions of content in the legacy content editor. Item revisions are a good way to track the development of an Item and its content. 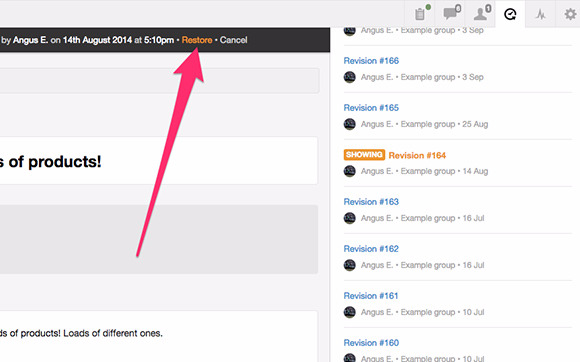 Every revision of an Item that is saved can be viewed, compared and restored in the revisions pane. 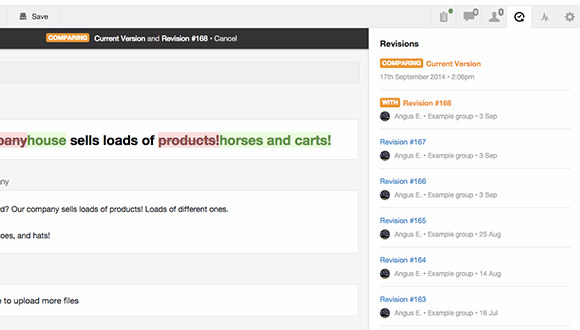 You will be able to see who saved the revision, when it was saved, and track the changes that have been made. By default you will be shown the current version of the Item compared with the previous saved version. Changes will be highlighted to make it easier to see what’s been edited recently. You should now see that restored version on your Item, and can begin working on it. NOTE: If the revision you're restoring to has a different template or structure, the Item will revert back to that. 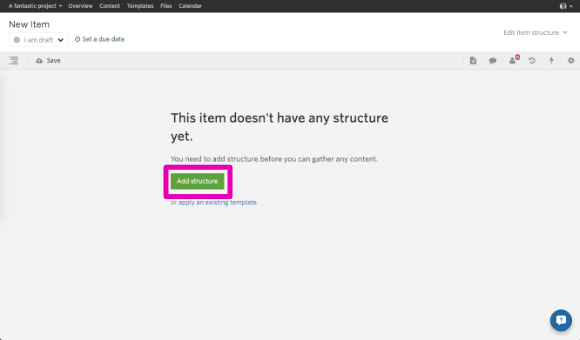 When this is a template, GatherContent will disconnect the template and convert it to a custom structure. Every time you make a change to a template, a new revision is created, making it easy to review different versions of a template. 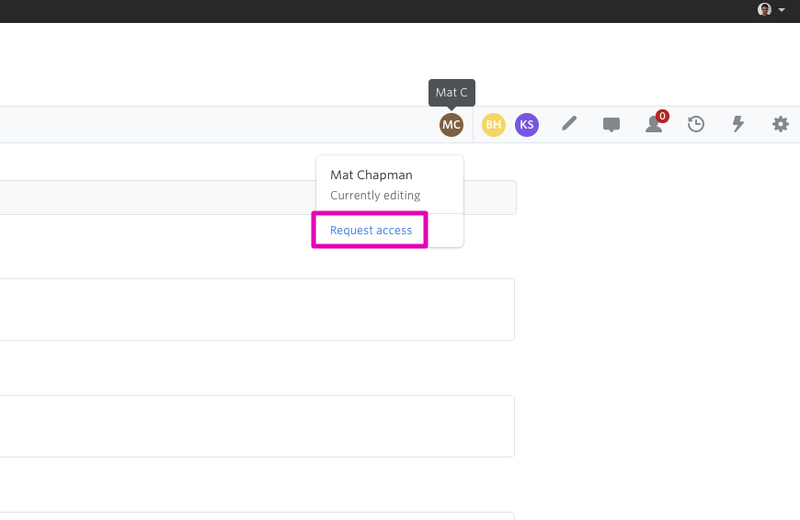 Additional: If you upgrade to the new content editor, previous revisions from the legacy editor will not be available. 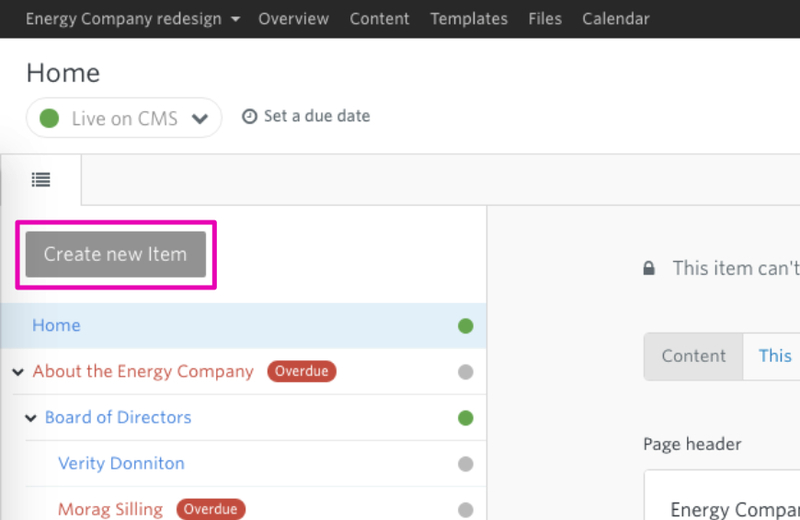 Use the item activity panel in the legacy content editor to track what's happened to an item as it's been worked on in GatherContent. Item activity is generated when certain actions happen within an Item. These actions are recorded in the "Activity" pane. Each piece of activity thats added will include the name of the user who generated the activity, and when it was generated. You can use the Item Activity pane to track what's happened to an Item as it's been worked on, and can tell you who's done what in the Item - giving you an organised view of what's happened and when on the Item; giving you a timeline of progress. You can also see a project wide overview of Recent Activity on the Project Dashboard. Here's how you can create new items directly from the legacy content editor. 2. Click on "Create New Item"
You can list multiple items at once if you are adding items in bulk. You can also nest items using hyphens to represent your content hierarchy, adding main pages and sub pages at the same time, for example. You can find detailed instructions about how to do this next to the input field. Entries items work as parent templates for items that have the same structure. See how you create these in the legacy content editor. An Entries Item works as a parent Template for a group of Items that will have the same structure: so Entries added under the parent will automatically inherit its structure. They allow you to control the template/structure that is being used with the Items. This is great for product pages, team bios, recipe pages, or any groups of items that have a repeating but rigid structure. You can edit the structure of the parent Entry Item at any time which will update all the children simultaneously. This is useful if you want to add a new field, such as a footer, to all of your items. This will be the structure that child Entries inherit. You can learn about structuring Items in this article. You can't apply a template to an Entry Parent, so you'll need to work with a custom structure. This will convert your Item to an Entries Parent. The Item can't have any child Items when you convert it. 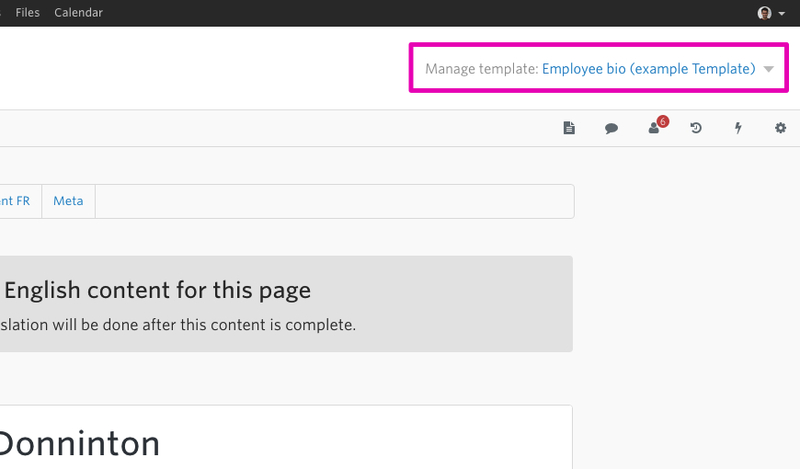 The entries will automatically inherit the structure of the original Item built (in this case; an employee bio). 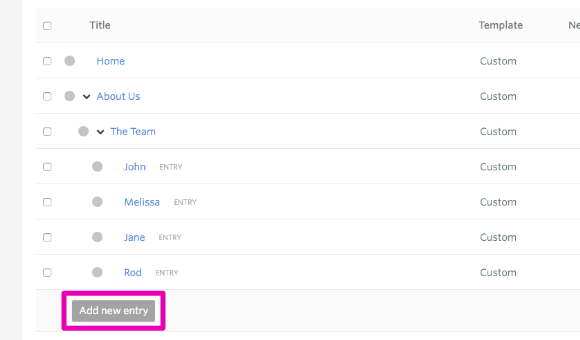 You can also add multiple Entries at once using the plus sign in the add entries window. 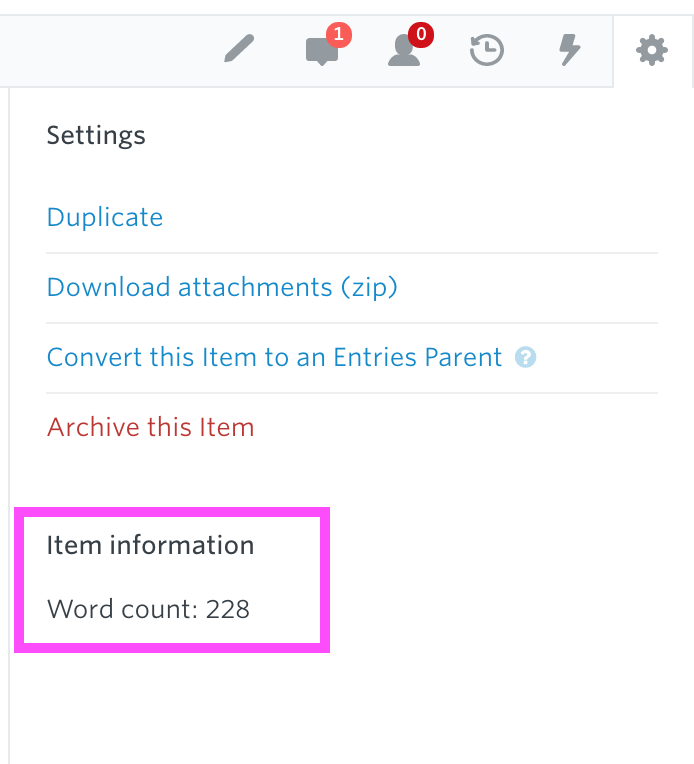 Tip: To convert Entry Items back to normal Items, you need to archive the Parent Entry. This converts the Entry Items back to normal Items and moves them to the top level, and the Items will all have a custom structure applied to them consisting of the fields that were applied to the Parent Entry before being archived. If a Parent Entry doesn't yet have any Entry Items, you can convert it back to a normal Item from the Item settings tab on the right hand side of the Item. This article is for the legacy version of GatherContent. The duplicated item will be located immediately after the original item on the Content tab. You can change the name of an Item once it's been created. You can do this either in bulk from the Content tab, or individually for an Item from within the Item editor. Update all the Item names you need to make changes to. When you're in the Item just click on the name. The changes will be immediately reflected on the Item. How to use notes in an item to provide additional written and visual guidelines. Item notes are a good way to add extra guidelines or supporting information to an Item. 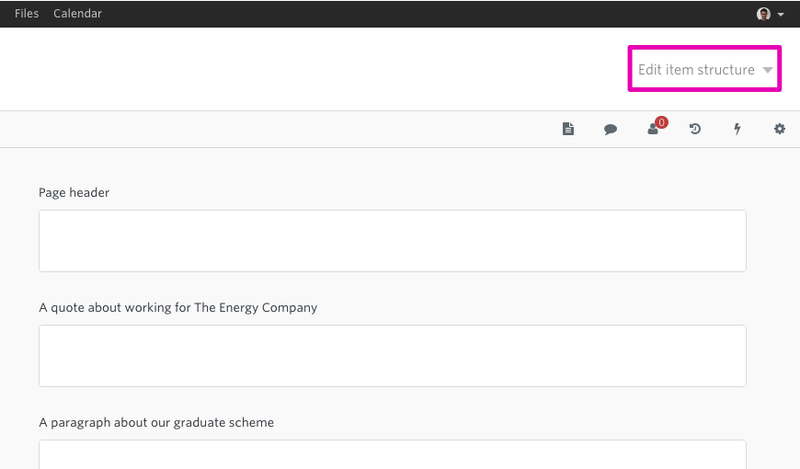 Every Item has a Notes section which can be opened by clicking the Notes tab in the top right of the editing area. You can format Notes to include tables and bullet points, and you can also attach images and wireframes in the Notes section. This is really handy as a means to provide a visual cross-reference for authors. 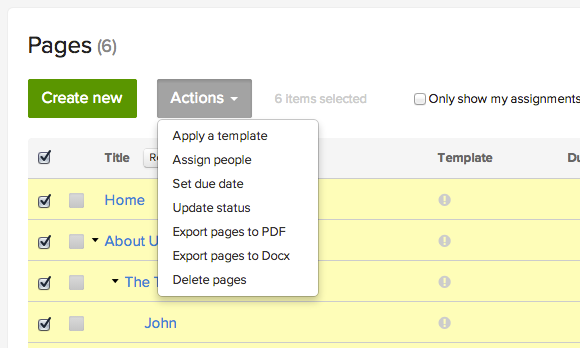 You can go back and edit, add to and attach additional files to Notes at any time. 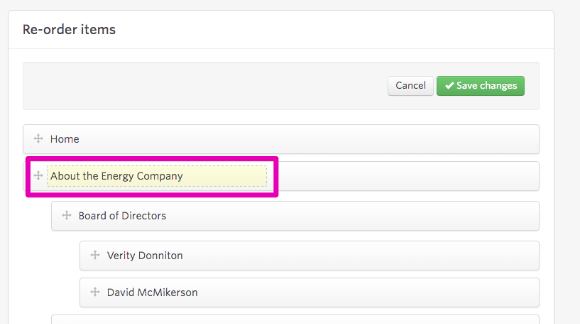 Tip: You can also add guidelines for individual fields. 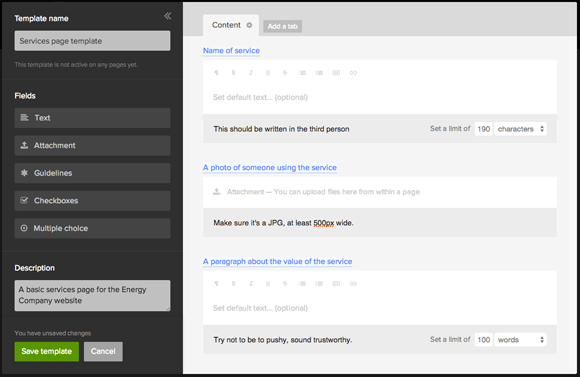 This lets you explain what’s required for individual sections of content. Instructions for assigning people to an item from the legacy content editor. Assigning someone (or multiple people) to an Item is a good way of letting them know they are responsible for it. 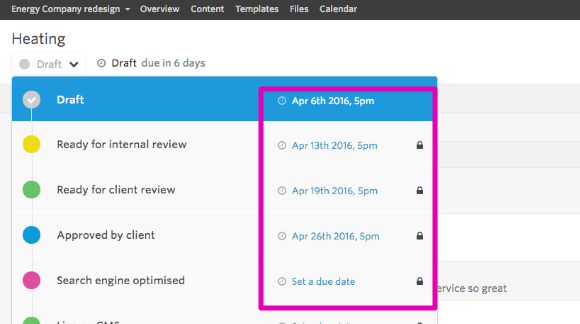 People assigned to an Item will receive notifications if it is nearing its due date (or if it's overdue! 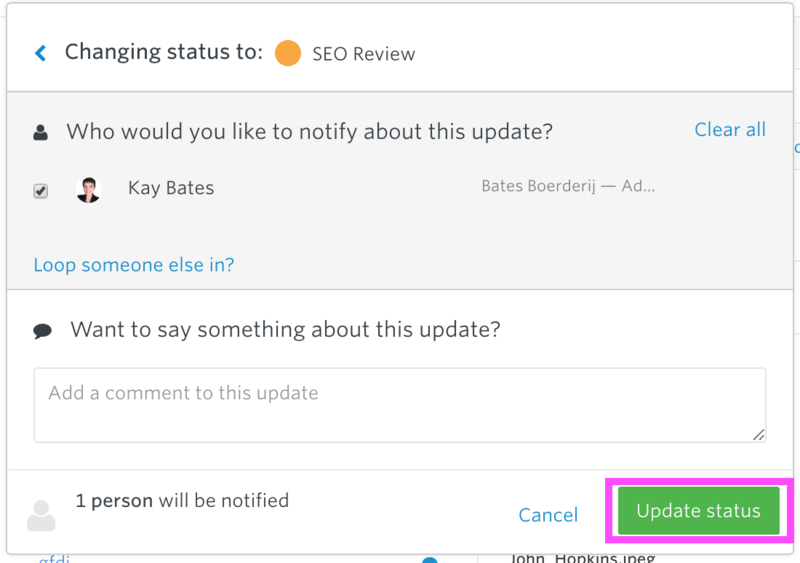 ), and will by default be selected to be notified when comments are made on the Item, or when its status is changed. 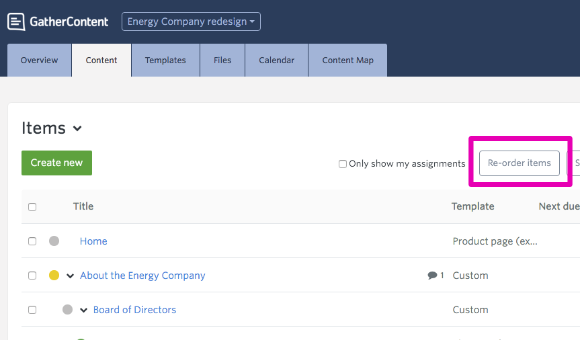 Items assigned to someone will be displayed on their Project Overview page and will be highlighted in the Content tab. 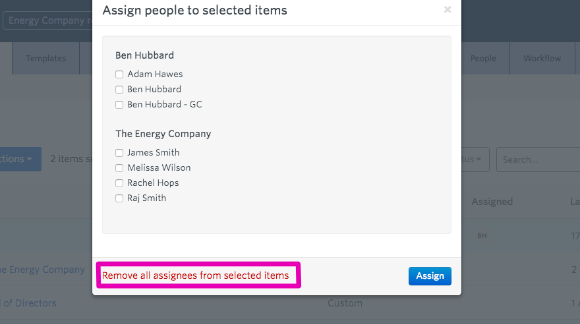 Click "Assign" to assign the Item to the people you've selected. Select the the Contributors tab. This will send the person an email inviting them to work on this Item. 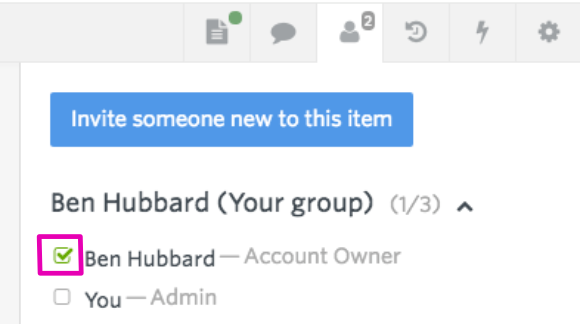 There are two ways that you can remove assigned people from an Item. All the people assigned to this Item will have a tick next to their name. Unchecking them will immediately un-assign them from the Item. No one will be notified of this change. 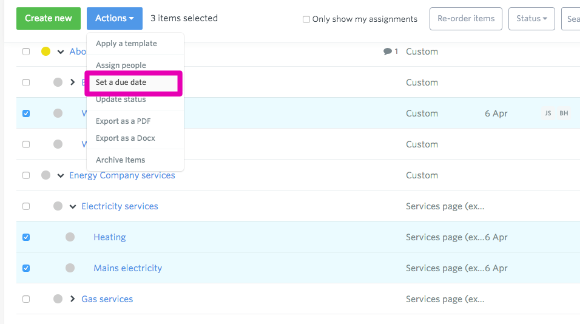 Here's how you can set due dates for an item from the legacy content editor, to clarify when they need to be completed. 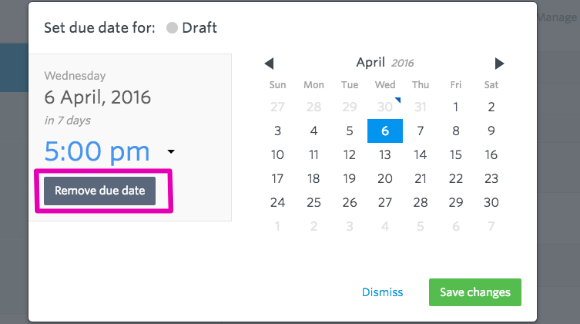 You can set due dates for Items to clarify when they need to be completed. Due dates are applied to workflow status' to indicate when that phase of work needs to be be completed by, and makes it clear all the steps that need to be completed, and when they need to be completed by before the Item is published. 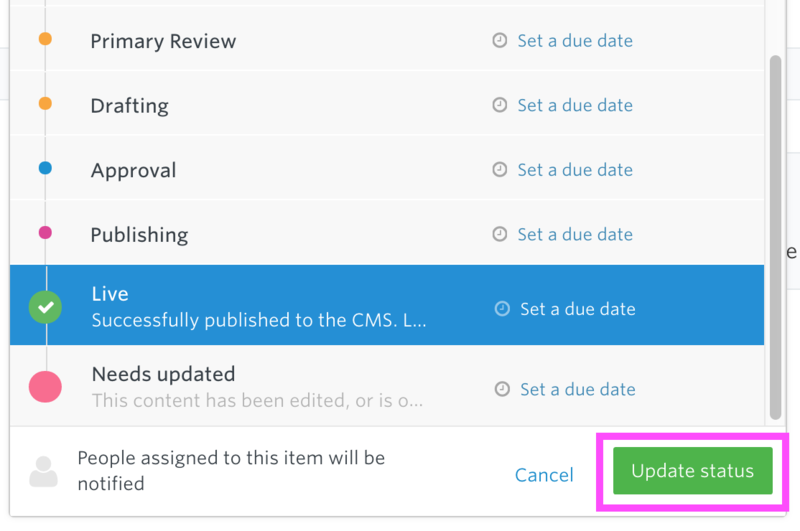 If an Item is still in its current workflow status when its due date is reached, it will be marked as overdue and will appear with an overdue notification throughout GatherContent. If someone is assigned to an Item, they will be notified when it's nearing its due date, and when it is overdue. You can learn about assigning people to Items in this guide. 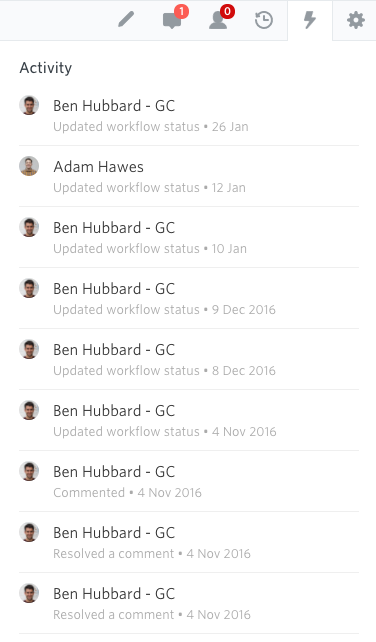 Tip: The final workflow status in your workflow such as 'Published' shouldn't have a due date, to allow your published Items to live on without an 'overdue' status. You should see a button that says “Set a due date”. 2. 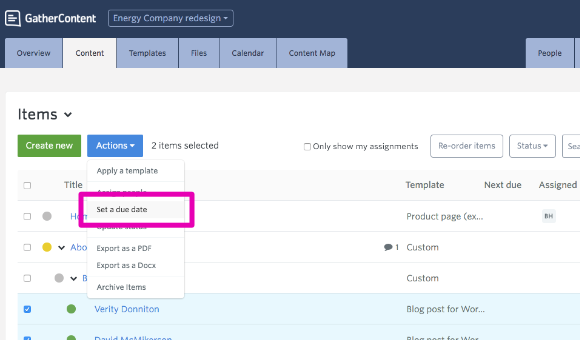 Select the date for when the Item is due and press "Save changes"
The Item due date for the selected workflow status will now appear in your project calendar and Content tab. Anyone assigned to the Item will be made aware of the deadline. 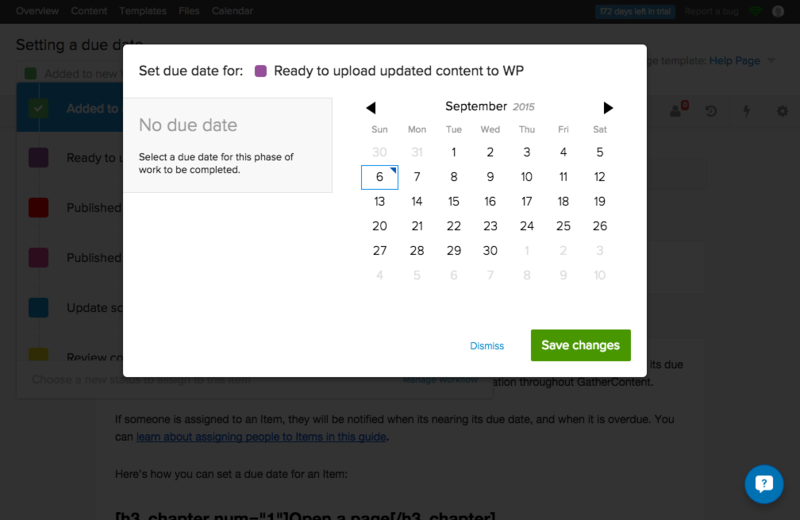 Click "Set a due date". This will be applied to all the Items selected. 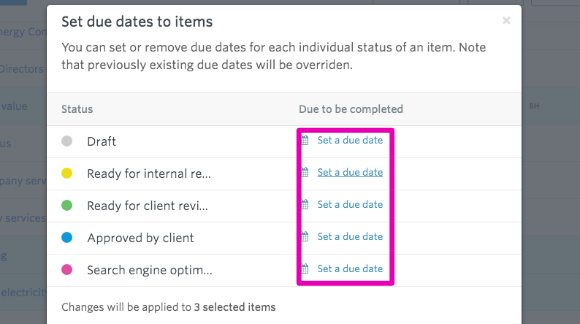 You can always update the due date you've set for an Item from the calendar or from the Item itself. 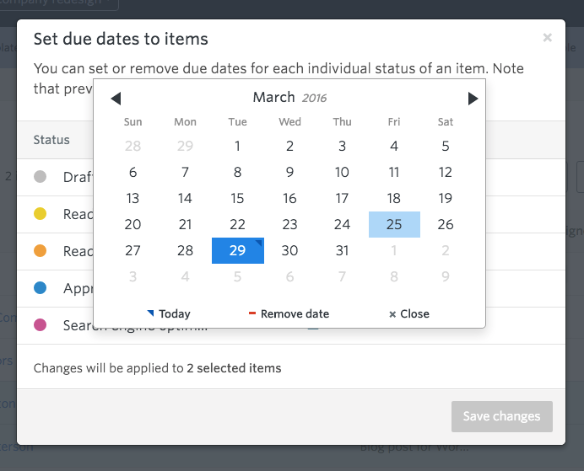 Here's how you can remove due dates from your items in the legacy content editor. From inside the item, select the workflow status. 2. 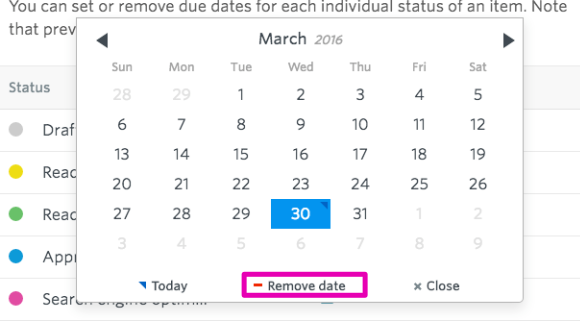 Select the due date for the workflow status that you want to remove. 3. Click 'Remove due date'. 2. Select the Items using the checkboxes at the side, click the actions drop-down button that has appeared, and then select 'Set a due date'. 3. Select 'set a due date'. 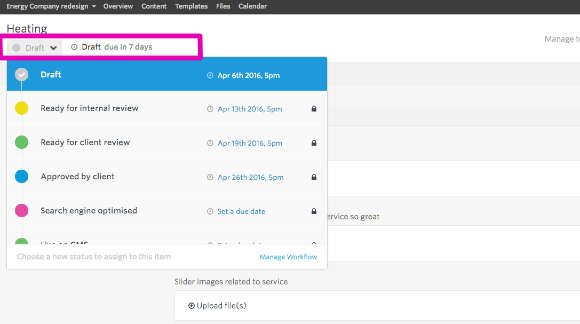 Select the due date for any of the workflow steps. 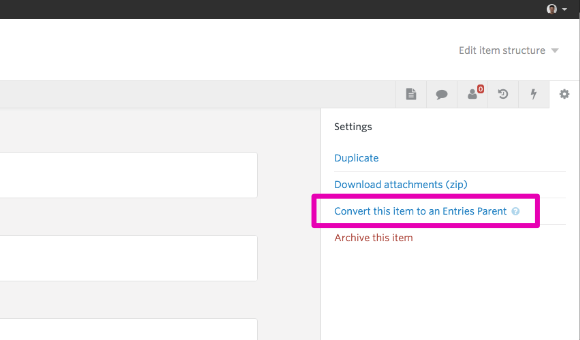 Learn how to add, delete, download & preview file attachments in the legacy content editor, and in the files tab in your account. 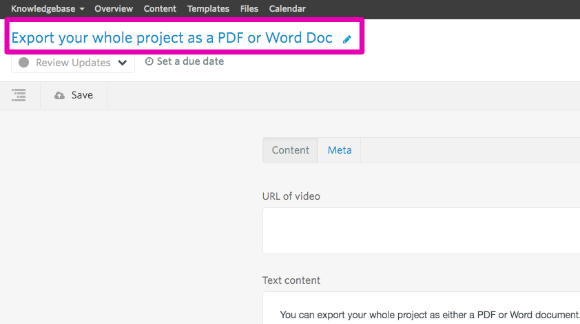 Files can be uploaded to an Item using an attachment field. You can upload any type of file but we have a size limit of 50 megabytes per file. The most common use for attachments is for images and graphics that will be embedded in your published content, or documents that will be downloadable from the Items. Clicking on a file will open a preview window. You can delete images or files by clicking on the ‘X’ that appears to the top left when you hover over the image or file thumbnail. Clicking on the thumbnail of a file which isn't an image will download the file. 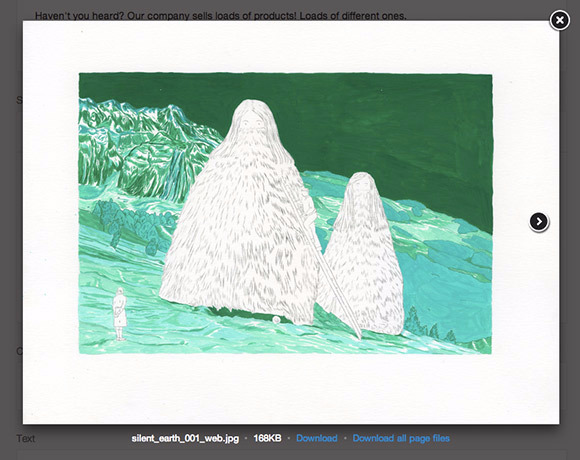 You can download an image, or all the Item’s files using the links below the preview. Tip: Any files or images uploaded to an Attachment field won't be compressed. 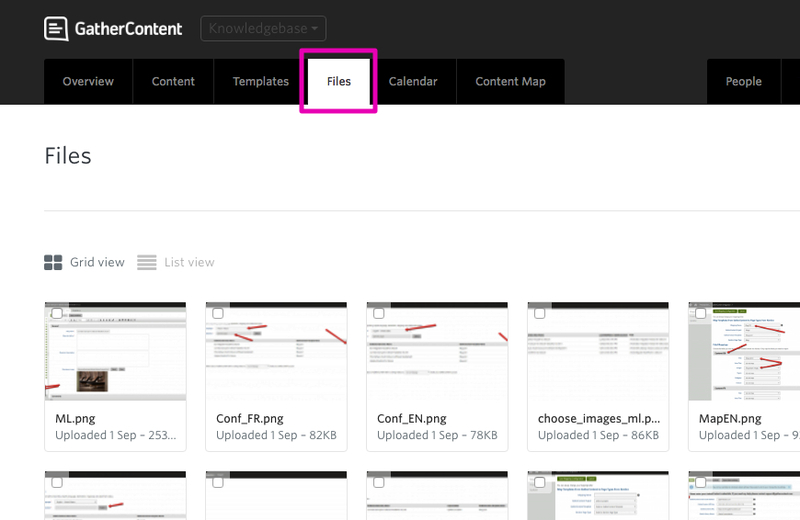 You can also find all the files in your project under the Files tab. You can also download a structured .zip folder of all of your files from here. Head to the bottom of the files tab, and click on the "Download all Items" button. From the Files tab, you can also download a selection of files from your project, by selecting the files you wish to download and clicking on "Download selected files". You can also delete files from here, by choosing "Delete selected files" instead. 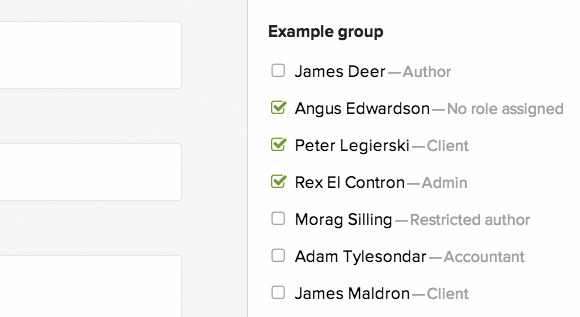 Find out more about the different types of fields in the legacy structure editor, which you can add to your template or item structure. This article is for the legacy structure editor. 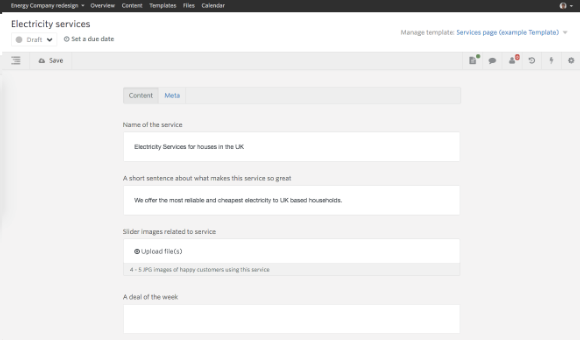 There are five different types of fields which you can add to your template or structure. These allow for you to be really specific when gathering content from authors and stakeholders. Text fields are used to store any text content. You can switch between a Rich Text Field (default) or a Plain Text Field, depending if you want to allow formatting. 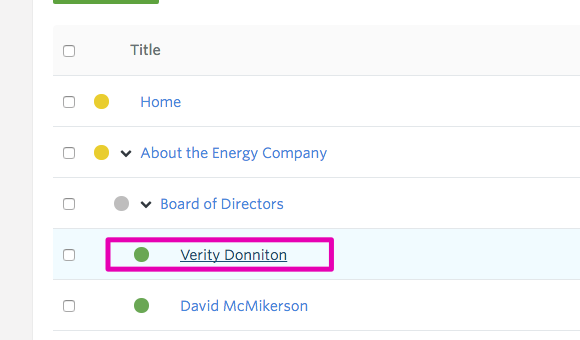 Add a label to your field to let your authors and stakeholders know what content is expected to be added. Use the field guidelines to communicate instructions about the field in a really context-specific place, rather than giving someone a multi-paged document of instructions. You can also add default text, which will be inserted into an Item when you apply the template to an Item. 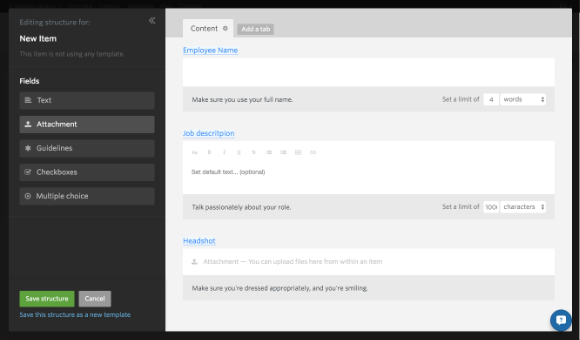 Attachment fields are how GatherContent handles anything that isn't text. This can be an image, a PDF or Word doc that's going to be attached to a webpage, or any file up to 50mb in size. These files aren't compressed or edited, and are left exactly as they're uploaded. 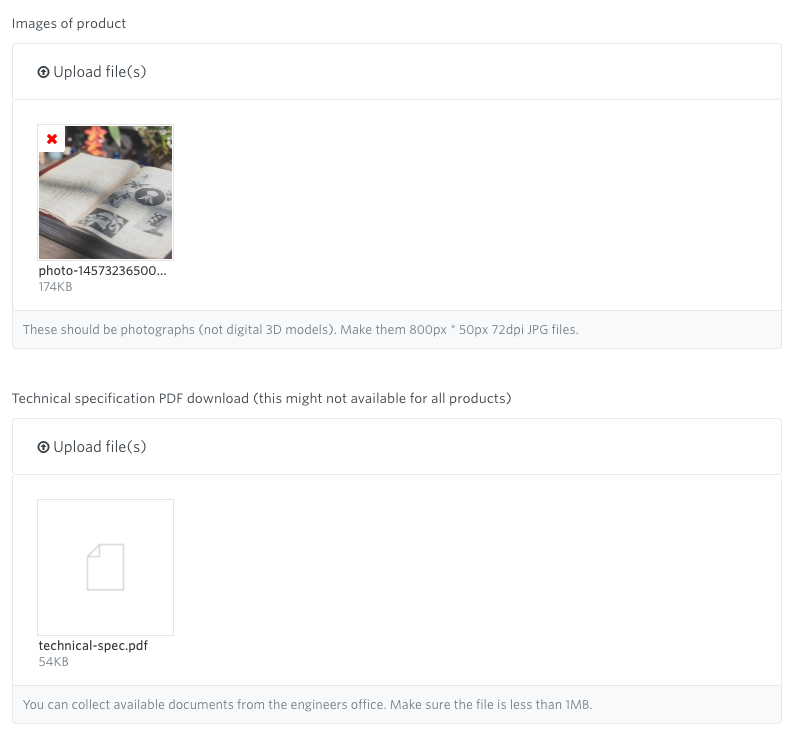 You can add a field label to all attachment fields so it's clear what files you're expecting to be uploaded, and you can add field guidelines to provide instructions. 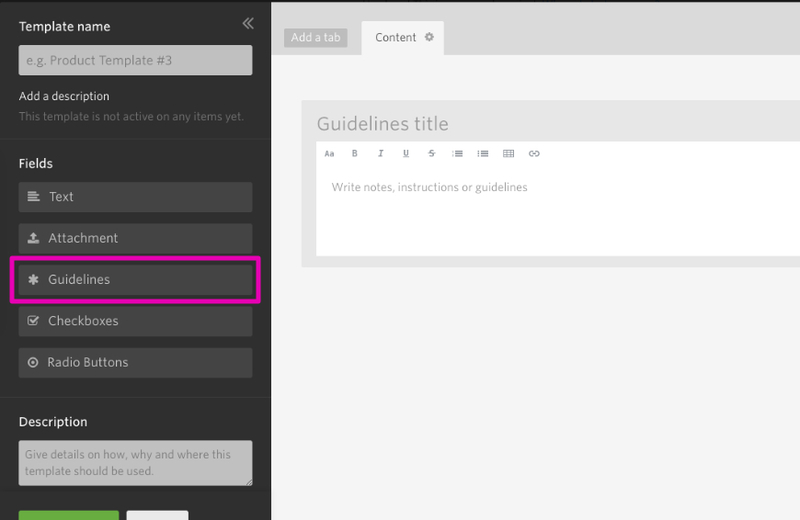 A guidelines field can be used in a template as an area to add instructions about the template. These are best used for more general instructions rather than the ones specific to individual fields. A Checkbox field can be used to collect information about the Item. Much like a Radio Button field (below), they are a set of defined variables that the author or stakeholder can select. But unlike Radio Button fields, you can select as many of these options as you want. A good example of this could be if a blog post needs a number of categories to be selected. A Radio Button field can be used to collect information about the Item. 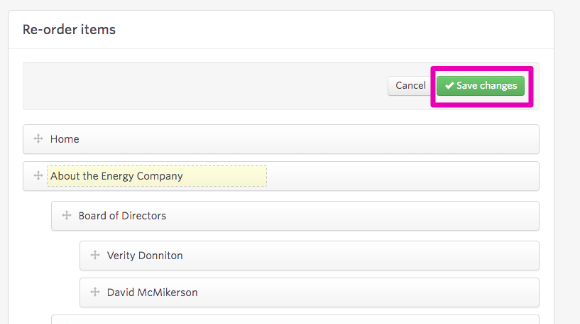 Much like a Checkbox field (above), they are a set of defined variables that the author or stakeholder can select. But unlike Checkbox fields, you can only select one of these options. You can also add an "Other" field. 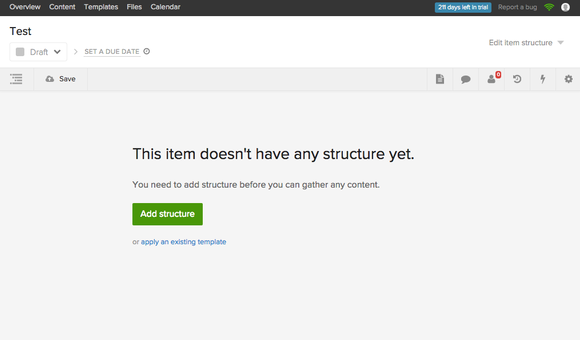 Here's how you can add structure to your items in the legacy structure editor. Adding structure lets you add content to items. Once you’ve got some Items in your project, you will probably want to add structure to them. Adding structure is important as it lets you add content to Items. Without Structure, an Item cannot have content added to it. 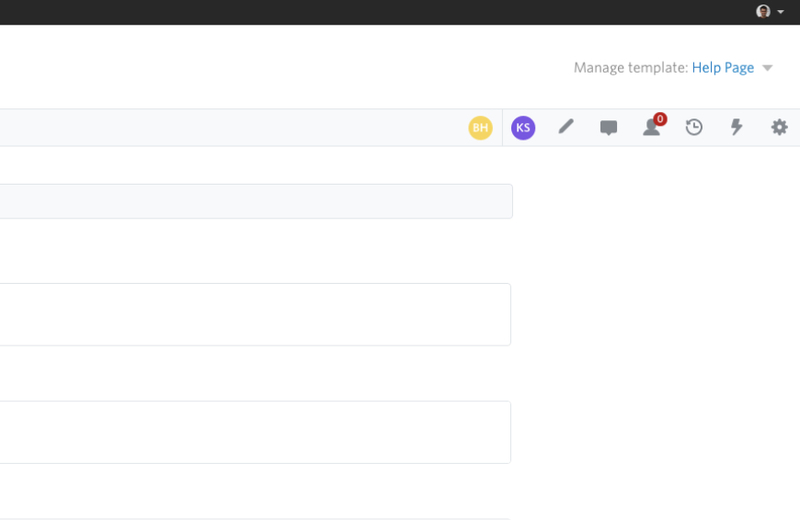 When we say adding structure; we’re talking about adding different content input fields such as text fields, file attachment fields, radio button menus and so on. These fields can then be used to collect the relative types of content. An Item can have either a custom structure applied to just that Item, or have the structure converted to a template, which can be applied to multiple Items. 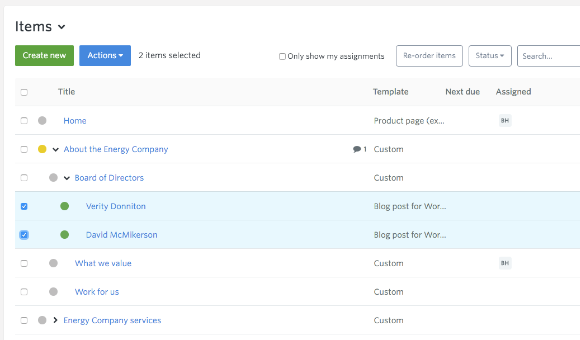 You'll need to work with templates if you're working with any of the integrations. 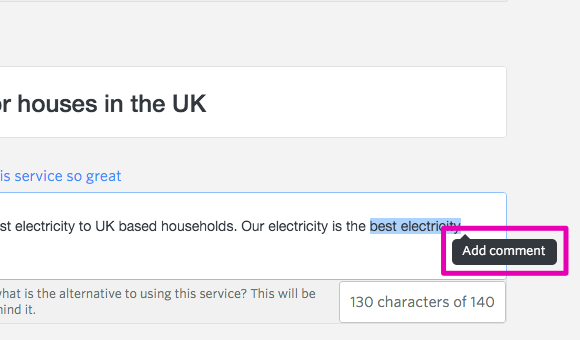 Customise fields to reflect the content you want to collect. You can change the name of the field (the ‘field label’), add some guidelines or a word/character limit. Do this by clicking in the label and editing it in-line. Select “Update structure” to save your Item. And you can now and add some content to your Item! Tip: Did you know that you can save Item structures as Templates. This makes it really quick to add structure to Items. 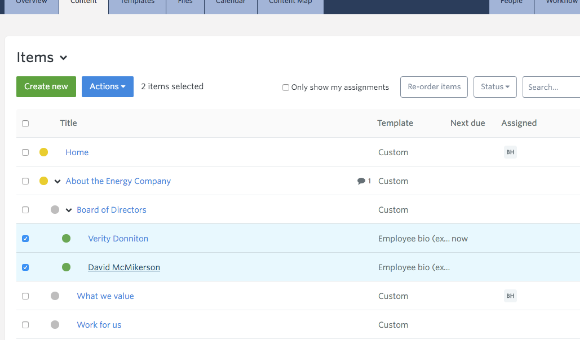 You can even apply templates to multiple items at once from the Content tab. Learn about using Templates in this article. Templates in the legacy structure editor are structures that can be applied to multiple items; useful if your items share a structure. Templates are Item structures that you can apply to multiple Items; they’re useful if you have a lot of Items in your Project that share the same structure. 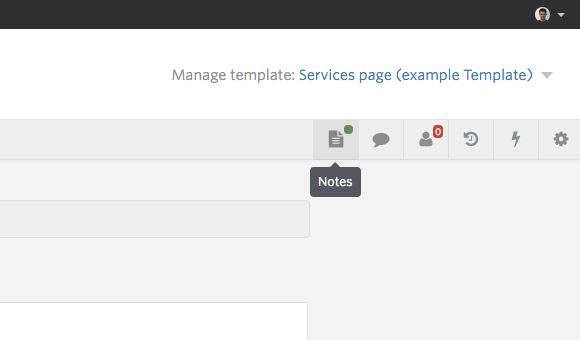 You might have Templates for Services pages, or Staff bios. 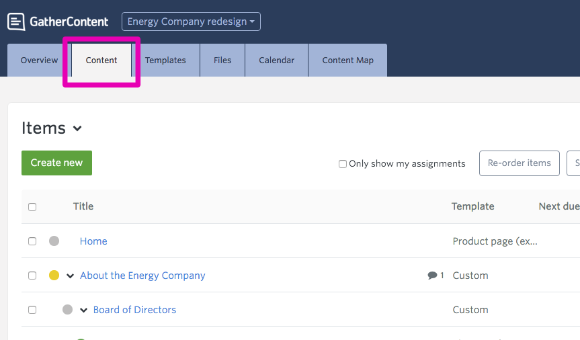 Templates can be found in each project in the Templates tab, and you can create new ones and edit them from here. 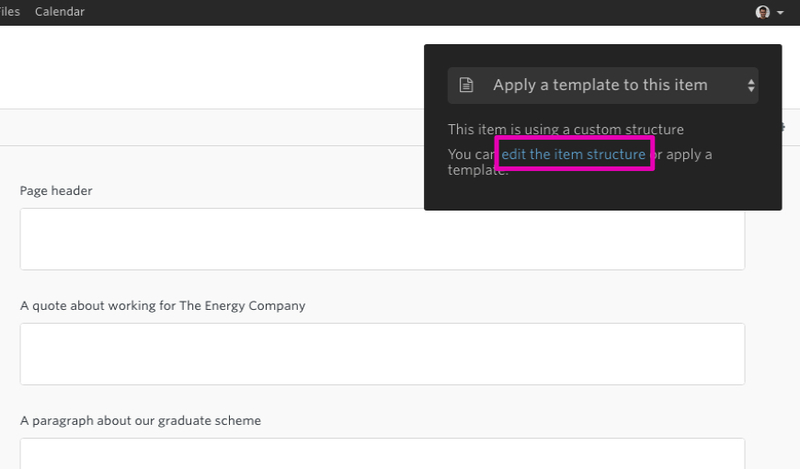 You can apply a Template to an Item when you create it, or to an existing Item from the Edit structure interface. 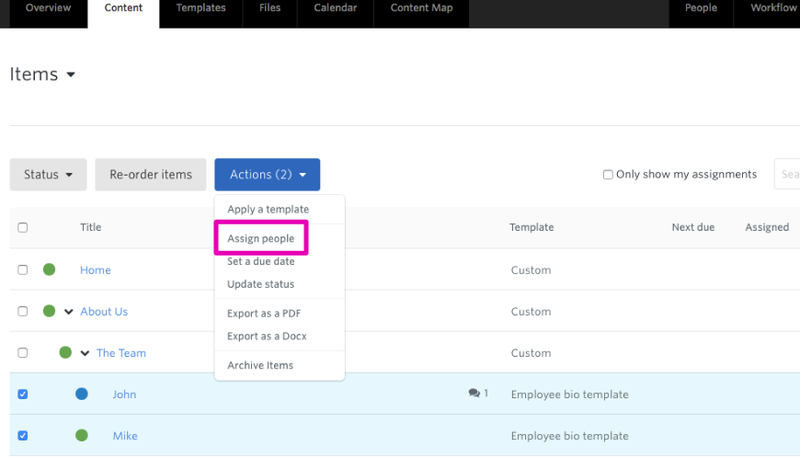 You can also apply a Template to multiple Items at once by going to the Content tab, checking off a few pages, and choosing "Actions", "Apply structure", then "Apply a template". 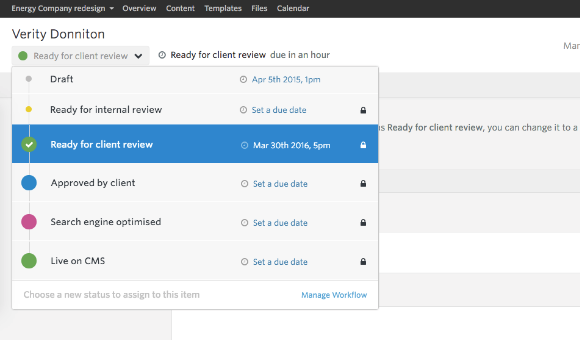 You'll need the necessary permissions to be able to edit and create templates. 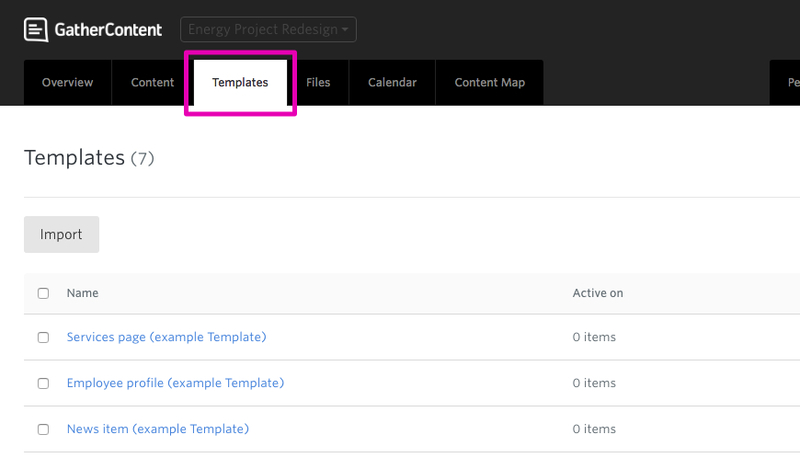 You'll see a number of example templates added here dependent upon the Project Type that was selected. Guidelines and word/character limits will be included in the Template. You can learn about structuring items in this article. You can edit the fields within your structure in the legacy structure editor, to ensure your content is written in the correct format. A template is a collection of fields, in a structure, which can be used on multiple Items at once. 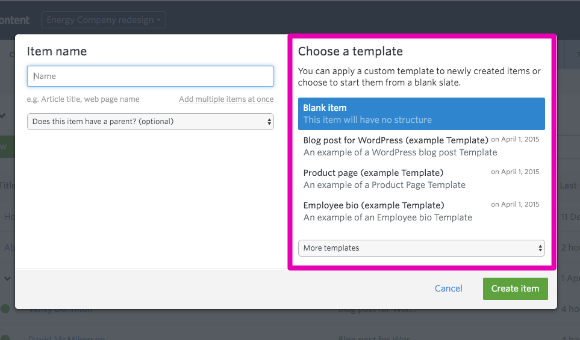 You can update the structure of a template, and see these changes reflected across every Item that the template is applied to. 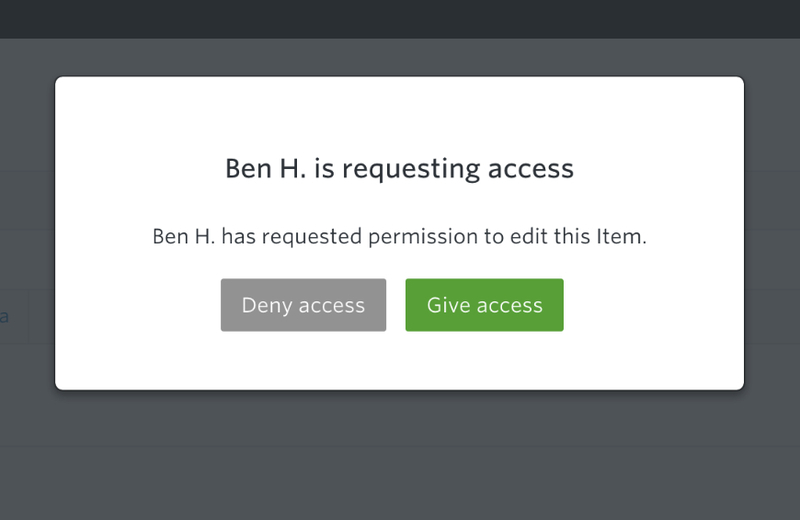 You might need some extra permissions to be able to access this tab. This will launch the template editing window. Click "Save template" after you've made your changes. This link will only appear if you have permission to edit templates. 2. 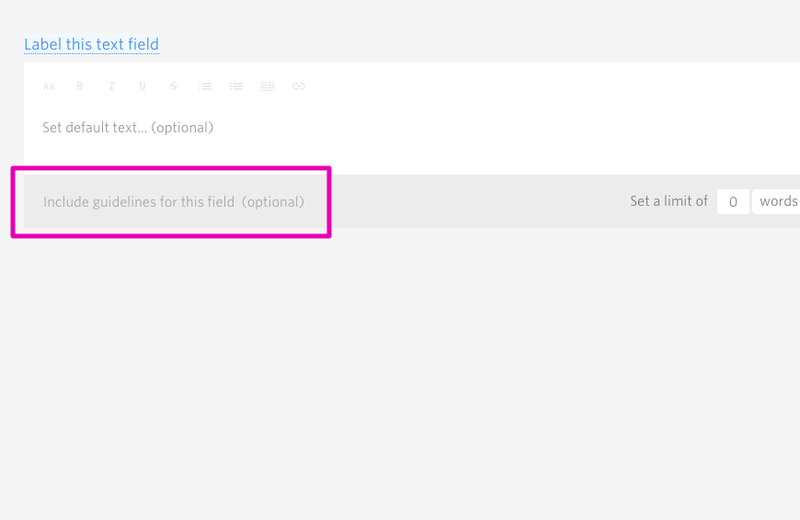 Click "Edit this template"
Removing a field from a template will cause all content stored in that field to be lost. Any content that is inadvertently lost can be restored from a previous revision. You can disconnect the template to convert it to a custom structure. This allows you to add unique fields to an Item. 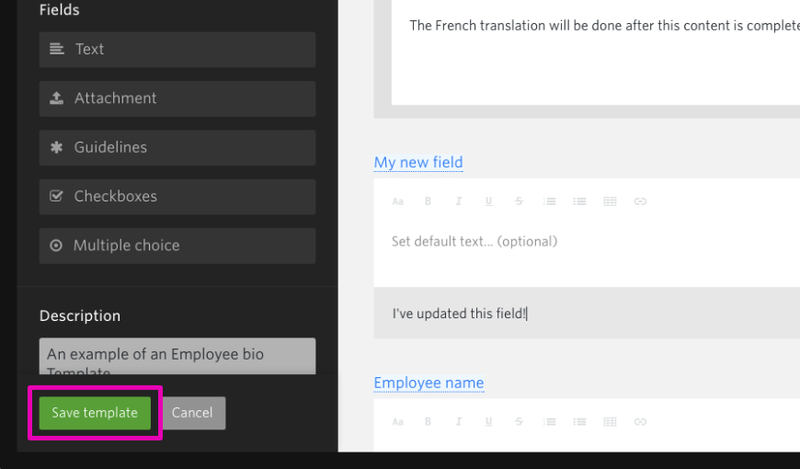 An example of this could be if you're working with staff bios, and the CEO's page needs additional fields, you could disconnect a template and add these in. 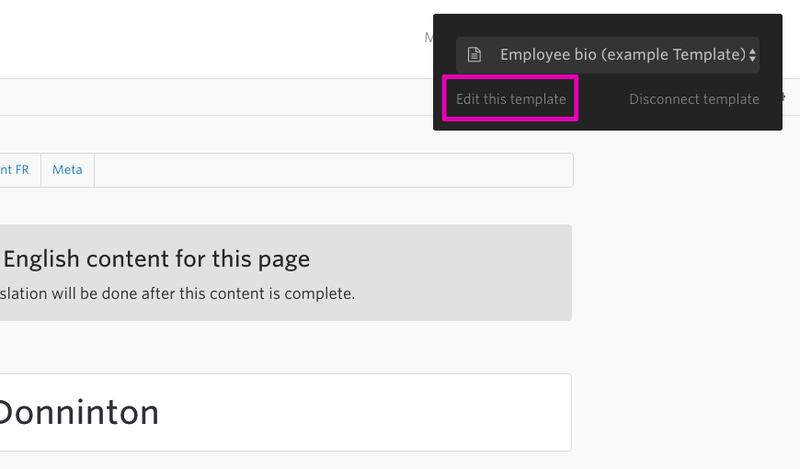 You can edit a template name from the template name field, when editing a template. When an Item doesn't have a template applied to it, it has a custom structure. A custom structure can be converted into a template if you want to re-use the structure elsewhere. 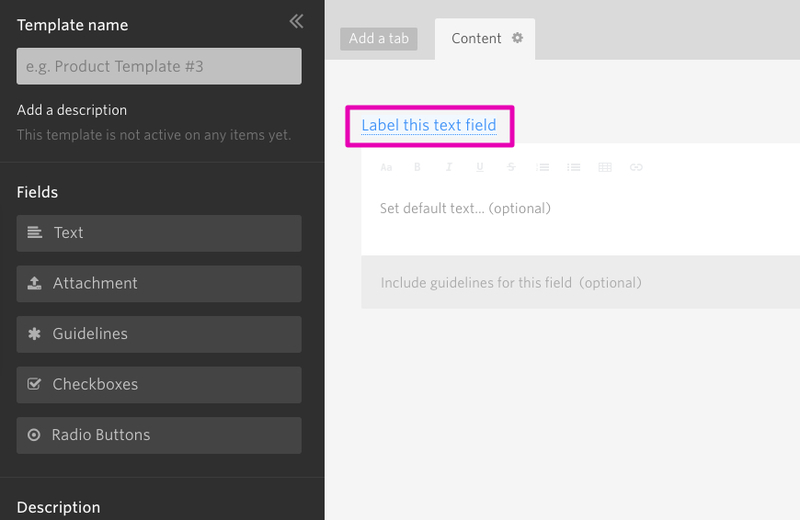 Adding default text to a template or structure means that when you apply your template to an Item, some content will be inserted into the fields by default. Updating this text will not cause any text already in a field to be overwritten, even if that text is default text. When editing an Item's structure, you can save the structure as a template. To do this, click "Save this structure as a new template". This will allow you to apply this structure to multiple Items. 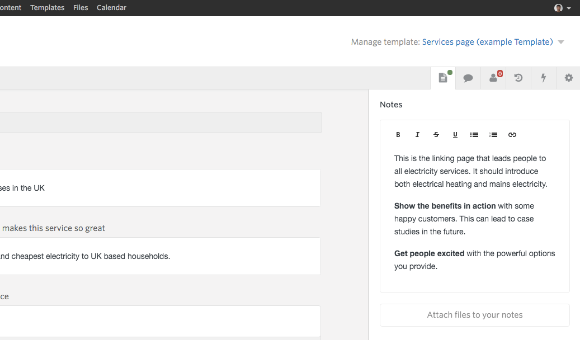 You can edit and reuse example templates. 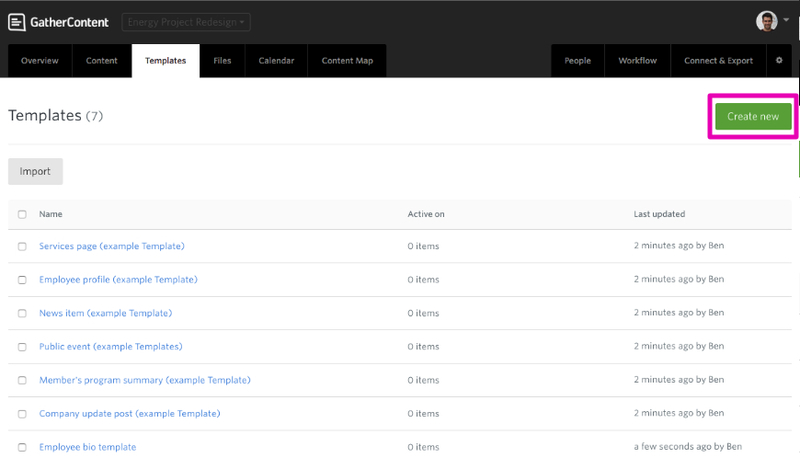 Example templates are added to your project by default based on the Project Type that you select when you created the project. These are a great way to see how other people have used GatherContent for the same type of content. 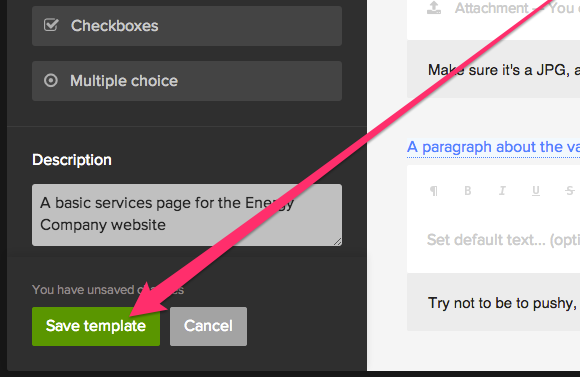 Tip: You can edit and reuse example templates. 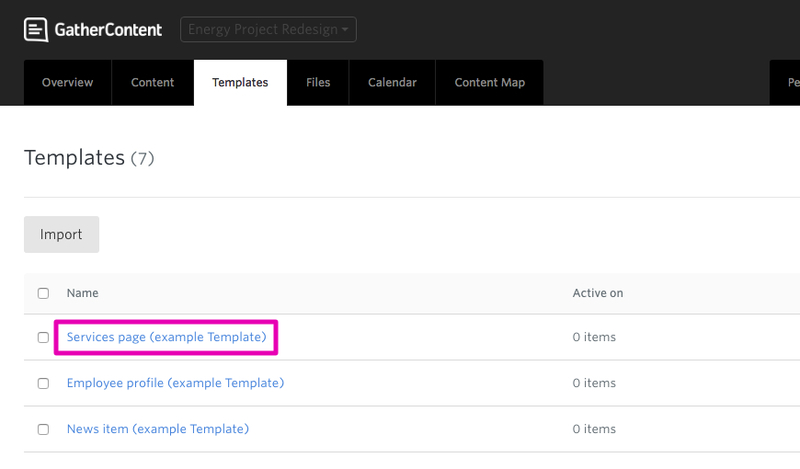 Example templates are added to your project by default based on the Project Type that you select when you created the project. These are a great way to see how other people have used GatherContent for the same type of content. Find out how to add, duplicate, delete tabs and make tabs private in the legacy structure editor. Tip: You can duplicate and delete a tab by clicking on the cog to the right of the tab name. Tip: Duplicating a tab doesn't duplicate any content entered on this tab. Only structure and guidelines are kept. If you need to make a tab public again, you can click the settings cog and select 'Make public'. How to set word and character limits on your items in the legacy content editor. 2. 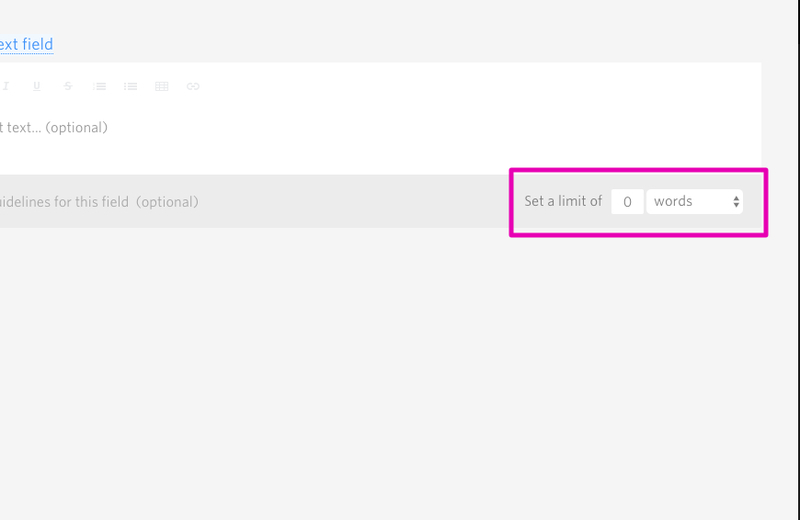 Once in template/structure edit mode, locate the field you want to add the limit to. 3. At the bottom-right of the field, choose the unit (word or character) and enter the limit number into the box. 4. Save the template or structure, and you're done! #1: When limits are in place for a field, they won't stop you from entering or saving content. They will just highlight that the limit for that field has been exceeded, so you can review it. #2: You can see the total word count of an item from the Settings tab of the item. You can include guidelines for every field in your templates. Here's instructions on how to create them using the legacy structure editor. You can include guidelines for every field in your items and templates. 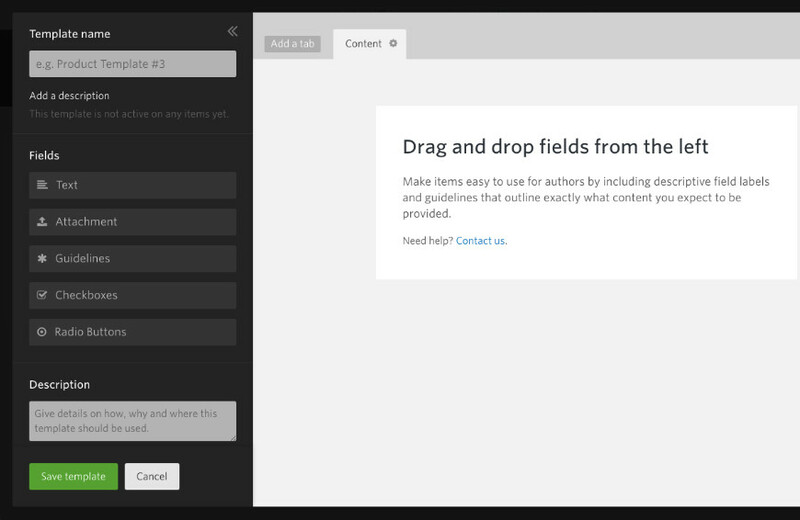 This will minimise back and forth and clarify what content you need to get added to a field. 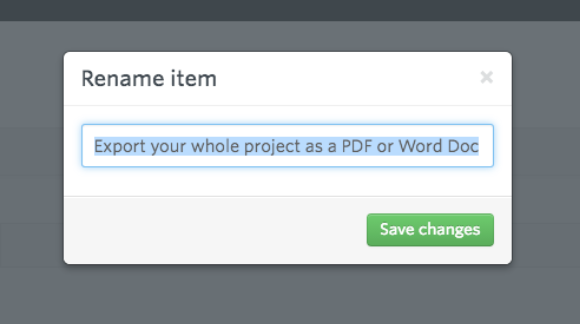 You can add word and character count limits to all text fields. 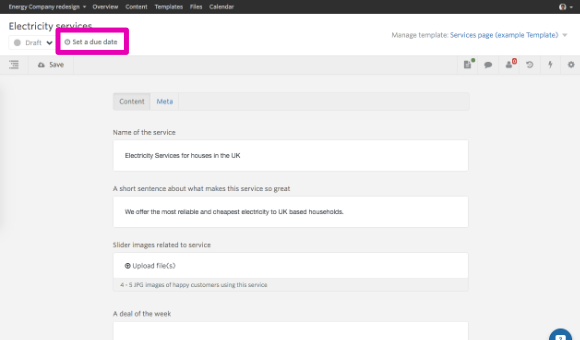 You can also include guideline fields on your items and templates to provide further information. Just click on the placeholder text and add a descriptive label for the field. The more information you can provide here the easier you will make it for each contributor. You can set text and character limits for each text field. These will notify users when they are exceeded. You can add a guideline field to provide even more information. 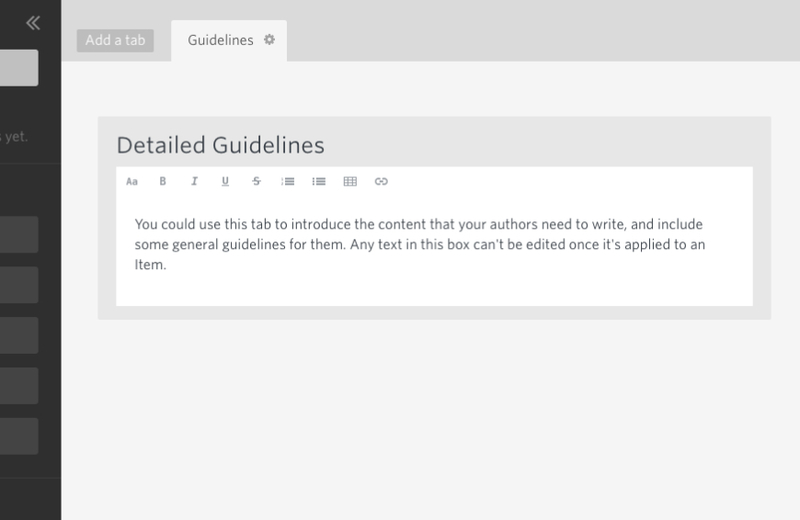 You can even add a guideline tab populated with multiple guideline fields to provide even more detailed guidelines. Item Notes are a good way to add extra guidelines, supporting information and attachments to an Item. Find out more about adding notes to an item.